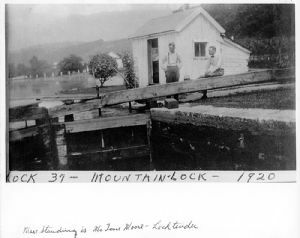 Tom Moore was the locktender at Lock 37 - Mountain Lock. Behind him is a lock shanty, a small buildings usually built on the island between the lock and the bypass flume at the upstream end. Such buildings would normally contain basic furnishing for the comfort of the lockkeeper, such as a chair, cot, and stove. They provided shelter from the weather and a place for the lockkeeper to rest when on duty. As the canal operated 24-hours a day, they often were virtually home to the lockkeeper during times when the canal was busy.